Just Genesis : Who Did Cain Marry? If Cain were born of Eve, the first mother, we would have to speculate that he married a sister or perhaps a daughter of his brother Seth. If Eve is the original mother of all humanity, she and her children would have lived at least 3.8 million years ago since that is the age of archaic human fossils. In this case, Cain's historicity is impossible to prove. That said, Genesis 4 describes Cain as a city builder and his descendants as metal-workers and artisans. This indicates that he was a ruler, as only ruler's build cities, and the technologies described place him in the Neolithic period. He would have lived about 3000 B.C., well after the establishment of Nilo-Saharan settlements (70,000 years ago) and inland settlements in Southern Arabia (55,000 years ago). He was one of the "mighty men of old." It is certain from the biblical data that Cain was not one of the first humans on earth. He was the first king of biblical history, however. The Bible tells us many details about Cain, all of them pointing to his rank as a ruler. When he was born his mother declared kan-itti. E.A. Speiser noted that Qany(ty) or Qan itti shows close affinity to the Akkadian itti, as in itti šarrim, which means "with the king". Akkadian was the language of the empire during Nimrod's time (BC 2290-2215). Genesis 10 tells us that Nimrod was a Kushite, so it is not surprising to find that Akkadian shares many words with Nilotic languages. Among the Oromo of Ethiopia and Somalia, itti is attached to names. Examples include Kaartuumitti, Finfinneetti and Dimashqitti. That itti is associated with Nilotic rulers is evident in the name Nefertitti. Cain was a tiller of the soil (Gen. 4:2). He controlled a territory as did Noah, one of his descendents, who was said to have planted a vineyard. Cain married his cousin, the royal daughter of Enoch (Nok) as evidenced by analysis of the Genesis 4-5 kinship pattern. He was a city builder (Gen. 4:17) as was his descendent Nimrod. These cities represent sacred centers of larger territories. Cain is associated with metal smiths and one of his descendents – Tubal-Cain – is said to be the “father” of smiths. Smiths held a high social status in the ancient world. Early in the upper Nile, Badari smiths smelted copper. These are the same people who used ritual flint knives for circumcision, such at that used by Zipporah. Cain’s name is derived from the word meaning “possession” or “lot”. As the first born son, he inherited the role of ruler. We might ask if he inherited it from Adam or by marrying into the House of Enoch (Nok). He was a religious man, offering sacrifice to God, though his sacrifice wasn’t always acceptable (Gen. 4:5). His bride named their first-born son after her father, which was the pattern among the ruler-priests of Abraham’s people. By the time that Jude wrote his epistle (c. 68 AD) Cain was solidly established as the archetype of an earthly ruler. Jude warns those who might abandon Christ because of their suffering and false teachers that God punishes those who rebel against Him. He uses three men as examples: Cain the ruler, Balaam the prophet, and Korah the priest. These were the three most sacred offices among Abraham’s people and they were often filled by people corrupted by the world. When we consider the king lists of Genesis 4 and 5 together, we discover that the lines of Cain and Seth intermarried. This makes Cain in historical time the first ruler named in the Bible to establish a territory which he named for his son Enoch. Enoch was born to Cain by a daughter of another chief named Enoch (Ha-Nock, Nok, Anochie). In other words, Cain married a princess to whom he was related. Since she named their first born son after her father, she was likely Cain's patrilineal cousin. This is called the "cousin bride's naming prerogative." The line of descent of Cain's princess bride is given in Genesis 4. She is not named, nor is her sister, the bride of Cain's brother Seth. The line of descent from Seth's wife is given in Genesis chapter 5. Both Cain's wife and Seth's wife names their first-born sons after their father Enoch/Nok, so we know their father's identity. When reading the "Begets" of Genesis 4 and 5, most readers imagine that they are reading about the children of Adam and Eve. Instead they are reading King Lists that reflect a fully developed pattern of marriage and ascendancy among Abraham's Proto-Saharan ancestors.This marriage and ascendancy pattern, involving two wives and two firstborn sons, can be traced throughout the Bible by tracing the cousin bride naming prerogative. Analysis of this material reveals that Cain and Seth married the daughters of a ruler named Nok. Nok is the Chadic form of Enoch/Hanoch/Henosh; and the Arabic Anoosha. Chadic words tend to be bi-consonantal. 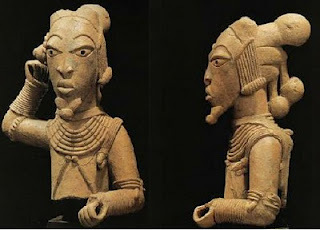 Enoch is likely derived from the Ancient Egyptian anochi which means "I" and is likely the royal first person pronoun.The word anochi is also found among peoples who migrated from the Nile westward, such as the Igbo and the Ashante. Among the Igbo, anochie means “a replacer” or “to replace”and among the Ashante the word ano kyi means "Ano Junior." In both cases, we find the idea of succession from father to son, suggesting royal descent. A Nigerian biblical anthropologist reports that "Anochie also means 'direct heir to a throne.'" Therefore the biblical name "Enoch" is associated with royal ascendancy. Likewise, Terah is not a name, but a title, meaning priest. Genesis 4 and 5 trace descent from a Proto-Saharan ruler who lived about 4500 B.C. and not from Adam and Eve. As we see from the diagram, the wives of Cain and Seth named their firstborn sons after their father. This naming prerogative of cousin brides continues throughout the Bible. We may assume from this that Cain and Seth married patrilineal parallel cousins, as did Abraham, Isaac and Jacob. It is also likely that Cain and Seth had second wives who would have been half-sisters, as did Nahor, Terah and Abraham. Bloodline among Abraham's people was figured through the mother, but social status (caste) and livelihood (occupation) were inherited from the father. Tubal-Cain is said to have worked metal. He would have inherited this from his father. The brides of Cain and Seth were of noble status. Their father was a ruler of great wealth who controlled the water systems of his region. During this time Africa was much wetter than it is today. The Chadic Sea was about 600 feet deep and sustained boating and fishing industries. The average fishermen used canoe dugouts, but nobles used boats constructed of marsh reeds lashed together and sealed with pitch. The Nile and central Africa were once integrated. It took a long time for these water systems to shrink. The region was still wet in the time of Cain and Seth. The connection of the major water ways, controlled by rulers and chiefs, explains how the House of Nok (northern Nigeria) and the House of Set (Nubia) became the controlling houses of Kush. Ancient Kush would have included Egypt, southern Sudan, Ethiopia, Somalia, Kenya and Tanzania. Now there is evidence that these Proto-Saharan rulers also governed Chad and Niger where they built pyramids that are 1000 years older than the Giza pyramids in Egypt. Recent evidence suggests that the Nile floods were much more extensive than previously thought. Space photos show that they spread nearly 100 miles west of the river and created "mega-lakes" in the ancient desert. Ted Maxwell of the National Air and Space Museum believes this is how the Nile Valley and central Africa were once integrated. It took a long time for these water systems to shrink. The region was still wet in the time of Kain and Seth. The major water ways were controlled by rulers whose houses were related by marriage. This explains how the House of Nok (Nigeria) and the House of Set (Nubia) came to control such a vast region. On the west, the Nile connected with the Chadic Sea, which in turn connected to the Benue and Niger Watershed in Nigeria (the Benue Trough). This is the region of Noah's flood. As a ruler, Noah probably had a fleet of boats constructed of reeds and pitch. The biblical flood likely took place during the late Holocene Wet Period in the only area on earth that claims to be Noah's homeland: Bor-No, meaning "the Land of Noah." It was the custom for the rulers of this region to have two wives. One was a half-sister (as was Sarah to Abraham) and the second wife, taken later in life, was a patrilineal cousin or niece. The second wife named her firstborn son after her father. This cousin-bride naming prerogative allows biblical anthropologists to trace the lineage from the earliest rulers in Genesis to Jesus. It also explains why there are two named Esau, two named Joktan (Yaqtan), two named Sheba and two named Lamech named in Genesis. For example, Lamech's daughter Naamah (mentioned in Gen. 4) married her patrilineal cousin Methuselah and named their firstborn son "Lamech" after her father. The intermarriage between the lines of Cain and Seth is paralled by the intermarriage between the lines of Ham and Shem and later between the lines of Eber and Sheba, and Abraham and Nahor. In fact, analysis of the Genesis genealogies reveals a consistent and unchanging marriage pattern among the Horite rulers before and after the time of Abraham. Note that the Virgin Mary was Joseph's patrilineal cousin and that both were in the priestly lines. Related reading: Cain's Princess Bride; Boats and Cows of the Nilo-Saharans; The Saharan Origins of the Pharaohs; The Marriage and Ascendancy Pattern of Abraham's Ancestors; Sub-Saharan DNA of Modern Jews; Are the Names Enoch and Enosh Linguistically Equivalent? "But what if Eve is the archetypical first mother, analogous to Mumbi among the Gikuyu? She then would represent the origins of a tribe of people (specifically Abraham's Nilotic ancestors), not the mother of all humanity." But if Eve was only an archetypal first mother, representing the origins of a specific tribe, then Original Sin would only have effected members of that tribe and not the entire human race, since only the first parents of members of that tribe would have committed Original Sin. There are different understandings of the Fall among Christians. Some emphasize Original Blessing which all humans enjoyed before death entered the world. By death comes sin and by sin comes death. It is the proverbial chicken or egg question. By Eve comes life, not death. Her name means "mother of the living." Note that Adam is not called the "father of all living." Sin and death do not enter because of Eve. St. Paul and St. Augustine speak of sin and death coming through Adam. The DNA of Adam is extinct, if we are to trust the calculations of molecular genealogists. So Adam's sin did indeed mean death and extinction for him. This is why Adam is not called the "father of all living." The ancients from whom we receive the information in Genesis may have recognized the durability of the Mt-chromosome and the loss of the original Y-chromosome. The most recent male ancestor of all males today lived in Africa around 59,000 years ago. The so-called "Mitochondrial Eve" dates to about 143,000 years ago. She is the mother of modern humans. She is not the mother of archaic humans. That Eve would have lived much earlier, at least 3 million years ago. Original Sin is not inherited. Were that the case, each would be held accountable by God for the sins of our ancestors. This is contrary to what the Bible teaches. See, for example, Jeremiah 31:30. The term "original sin" was unknown in both the Eastern and Western Church until Augustine (c. 354-430). The inheritance from Adam is not guilt, but death (I Corinthians 15:21). What, besides the cousin bride naming prerogative, are some of the characteristic naming patterns that we need to be aware of when studying the Holy Scriptures? For example, what prerogatives pertained when the ancients chose important place-names (cities, or wells, or mountains)? Do the familiar ones beginning with the prefix "beth", such as Bethesda (House of Mercy); Bethlehem (House of Bread); Bethany (House of Dates (? )/ House of Anaiah (?) / House of Misery (?)) indicate that the place was being named after a person -- in particular, a female person (such as, when the ruler wanted to name a place to signify where one of his multiple wives resided, or perhaps after his female descendants for whom he had established possessions)? Or is it reckless to assume that these places have a significane in terms of some fixed naming patterns that were operative and that were scrupulously honored in the families of Abraham's people and to which you have, elsewhere, ascribed quite a lot of significance (the "seed of the woman" hypothesis)? Place names are tricky because places were renamed. Bethlehem is an example. Beth-lehem means house of Bread. Probably the older name was Bet Lahm; as in the Arabic. It means House of Meat. Ephrath was the wife of Caleb and the mother of Hur/Hor (I Chron. 2:19 and 50). Likely priests of the Horite lines who lived in Bethlehem were called Horim-Mathea, that is to say, ruler-priests of the Matthean line. This is significant as we consider the enigma of Joseph of Ari-mathea. The H is apparent in the Aramaic and Arabic, as in Harun (Aaron). It is fairly safe to say that wells were named after the rulers who controlled them. Beer-Sheba belonged to the royal house of Sheba. Ainu ~ (Arab./Heb.) Ein/Ain (wellspring); another name for Ainu is Utari, which is very similar to other words for water (udra/udor/hydr, and possibly Basque 'ur' (water, perhaps furrow/irrigate). Surprisingly, I also see a parallel in the Etruskan myth of Tages (white haired baby/old prophet discovered in a furrow plowed deeper than usual (drainage ditch/canal? ), with reference to baby Moses and prophet Noah. "Furrow/track/trail" was the root of many words including orbit, Ogham Irish script (og mo linear incision), week [woch from ger. wehsal], last & (de)lirium [from PIE leis], probably meaning linear reciprocal motion, and related to boats plowing through waves (viking vika, Polynesian vaka, Mandan wada; Ainu wakka "water"). You are correct about the Moses and Noah connection. Both rulers are associated with reeds. The word "gophir" is found only two places in the Bible; reference to Moses' reed basket and Noah's reed boat. The Ainu Waka may have been wa-ka. The ka is a well-known hieroglyph. The W was a water glyph. Its opposite was M, the glyph for mother. Could you possibly illustrate a proposed family tree going down to the birth of Noah? 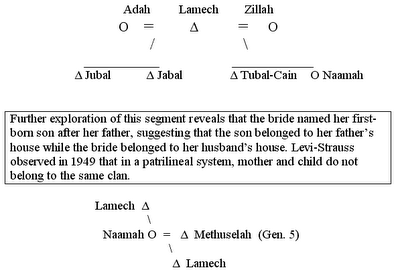 Lamech the Younger (shown in the diagram) is the son of Methuselah and Naamah (daughter of Lamech the Elder named in Gen. 4:18). Lamech the Younger is Noah's father, according to Genesis 5:30. B.C. 2238-2163 - Arpachshad, son by Asshur's daughter, probably his cousin-wife.